This is another helpful book from the Good Book Company. The author is the Senior Minister at Christ Church, Mayfair in central London. Though I was not familiar with the author, over the years I’ve read several books about time management so this book caught my attention. Fuller writes that many of us feel a famine of time, never having enough of it to accomplish our goals, constantly running from one thing to the next. He writes that obsessing about time, being burdened by a lack of time and feeling guilty all the time is bad. How we can get off this hamster wheel is what this book is about. Fuller writes that time is a gift that we’re designed to enjoy. What needs to change is how our hearts view the 24 hours we are given each day. 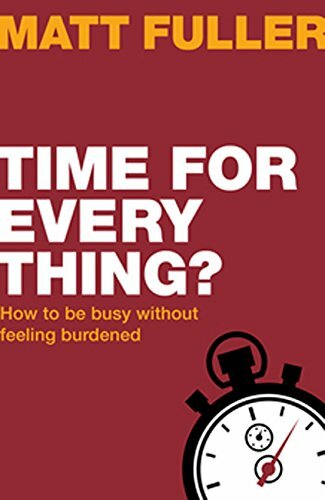 In the first half of the book Fuller lays the foundation in terms of how we view time, busyness, and burdens. In the second half, he looks at how we use our time well (and avoid using it badly), in the areas of work, family, church and leisure. He writes that feeling burdened is a sign that something is wrong in our view of life, because there is something wrong in our view of God. To deal with the above burdens that weary us, he looks at what Jesus is offering us. He tells us that only if we fully embrace what Jesus has done to win our salvation, and live out our status as someone who is saved—will we be able to take off the other burdens that he mentions. Fuller looks at how to be busy, yet calm, by living our lives in dependence upon the Lord, rather than living functionally in independence from Him. He encourages us to live each day in trust, rather than with anxiety. He suggests two ways that we can waste our time – by being idle or easily distracted and by being focused on and dedicated to the wrong things. But Jesus has called us to make the most of the time that we have been given by him, to be used for him. Fuller states that we need to look carefully at the competing demands upon our time and plan our time so that we don’t waste it. We need to consciously decide where we place boundaries on our use of time, or we will be at the mercy of others and boundaries will be imposed upon us. The book ends with a number of examples of how people the author knows have chosen to use all their time in freedom in the area between neglect and idolatry. He writes that we have to regularly make time to work out how best to use our time. All of our time belongs to the Lord. We must do all that we can to make the best use of our brief time here on earth. We do it trusting in him, serving him and following him, and looking forward to being with him. I found this to be a helpful, theologically sound book on considering how to use the time we have been given by the Lord.